We spent 9 days in Chandler and Gilbert, Arizona with trips to Phoenix and Scottsdale. Our hosts planned to take us to high, cool Paysan, but the appointed day was rainy below and snowy above it was a poor day to go and we didn't. The streets in Chandler-Gilbert are unbelievably wide. Wandering side streets easily carry one lane with parking on both sides. The arterials are mostly six lane plus turn lanes at major intersections. Speed limit is often 45. Housing: We are staying in a 2300 square-foot home with high ceilings and triple garage and back yard about 25 feet deep. 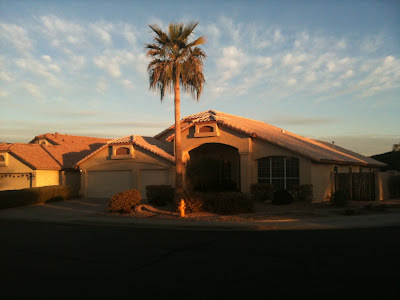 It has "Arizona style" with adobe and tile roof. I like it. A house with the same characteristics on a nearby quiet street is for sale by the bank - asking $209,000. Real estate brochures list NEW homes for UNDER $100,000. Empty houses: yes. New and old. And there are large, vacant tracts waiting to be developed. Malls: Large, grand ones; smaller ones; strip malls. Everywhere. Walking: Not so good. Where we are the distances are too large to get anywhere in less than a mile, except for small private parks between the houses, which are owned by the neighborhood association; they are always set low because they receive the runoff of heavy rainfalls. I sure like being half a mile from shopping and three blocks from a major walking/biking trail, the Burke-Gilman Trail. On the road: to Las Vegas today. Different route home to see old work friend Marc. Photo: House built the same as the one selling for $209,000. Click to enlarge.